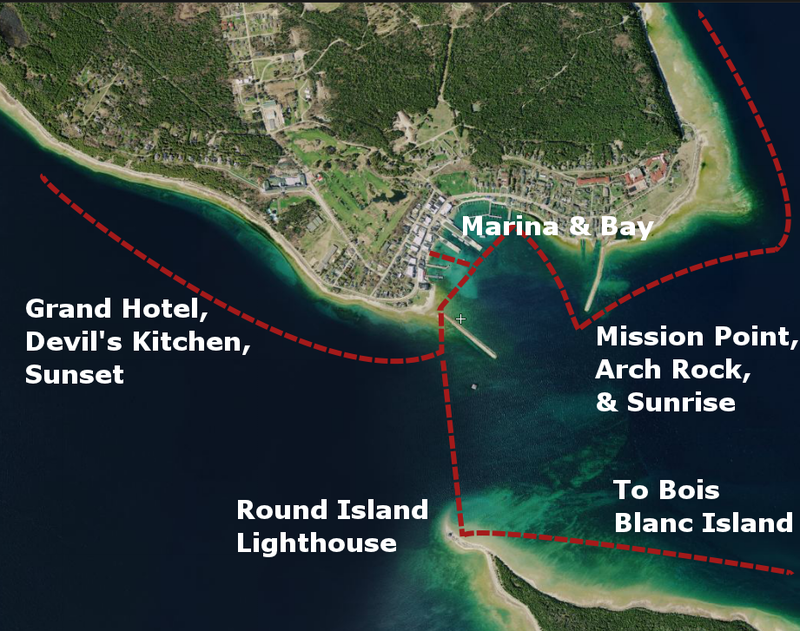 Our typical routes, described in detail below, have been designed to give you the best options for kayaking and paddleboarding around Mackinac Island & Mackinaw City. When you book a tour in advance with us, there is no need to make a decision on your route just yet. You and your group are free to choose your destination when you reach our beach, at the time of your reservation. All tours are custom tailored to the interests, weather, and experience level of your group. A guide accompanies all groups, free of charge, to give you the best tips on location, history, safety and general paddling. When you know what date you would like to reserve, book your tour online to secure your time. Don't delay! Our tours are popular and they fill up fast! 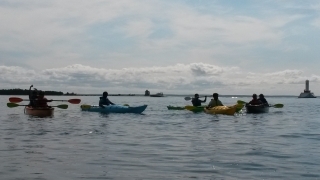 We start each day at Great Turtle Kayak with one of our favorite tours: the sunrise tour to Arch Rock & the Rock Maze. And we end our day with the spectacular sunset tour near Devil's Kitchen and the Grand Hotel. Immerse yourself in the rays of the Sun in absolutely the most gorgeous times of day. Take a relaxing cruise around the breakwall and ride the waves as you bathe in the picture perfect waters and epic skies of the East and West. Enjoy a tour around Mackinac Island harbour. Hugging the docks and joining the harbour traffic until you reach the marina. Glide next to the variety of docked gems as you view the Fort from the water. 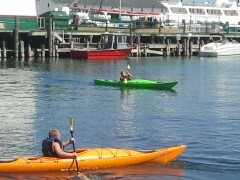 Test your paddling skills by maneuvering under and through the marina. Venture around sailboats and in between the breakwalls to get a stunning peek at the lighthouses and passing freighters. Reserve a Marina Tour Online Now! Enter the Straits outside the East breakwall towards Arch Rock, and coast over the beautiful underwater caves and rock formations of the Rock Maze to arrive the old fashion way... by water! Picture taking, sunrise tours, and snorkeling are a couple of the favorite options of this highly recommended tour. Reserve an Arch Rock Tour Online Now! SUP Yoga is the latest trend in aquatic recreation is gaining popularity quickly across the nation, and Great Turtle Kayak Tours is excited to be bringing it to Mackinac Island this season. SUP changes the yogi’s relationship with balance; forcing the practitioner to concentrate and come fully into the present, while engaging core and stabilizer muscles. For seasoned yogis fundamental poses are suddenly rediscovered in new ways and with fresh awareness. For beginners, this can be a great way to have fun, splash around, and try something new! Our SUP guide/Yoga instructor teaches beginners daily. 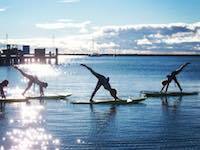 Not only is SUP Yoga an exciting physical and mental practice—it takes place on beautiful Lake Huron. Find solace and solitude as you leave worries on the shore. Mackinac Island is world famous for its beautiful coast and sights. Allow the splendor of the island and the wonders of the natural world to fill your heart with gratitude throughout this mindfulness practice. Gift yourself this unique experience of communing with your inner self and nature in the midst of stunning Lake Huron. You won’t regret it. Reserve a SUP Yoga Tour Online Now! Brave the straits and go outside the west breakwall towards Devil's Kitchen! Enjoy unprecedented scenes of the Mackinac Bridge, Mackinac Island Lighthouse, Round Island Lighthouse, the Grand Hotel, and the West Bluff as you ride waves and take in the scenery! Picture taking and sunset cruises are a couple of the great features of this highly recommended tour. If you are experienced and want to challenge yourself, paddle across the Straits of Mackinac to a little place called Round Island. Officially Hiawatha National Forest, Round Island is famous for its historic Lighthouse, which has guided boats through the Straits of Mackinac for over a century. Lush forest awaits you, along with the perfect photo opportunities for a once in a lifetime chance to capture raw island nature untouched by man for hundreds of years. Take a quick lighthouse visit, a bird-watching day trip to the East side, or make it an overnight campout! Any way you prefer, the Round Island tour is always an adventure that you will never forget! 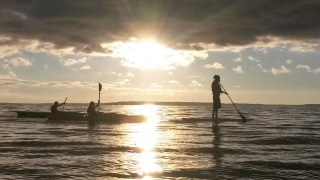 If you are daring enough to challenge yourself, then paddle across the Straits of Mackinac to visit our neighbors on Bois Blanc Island (Boblo). Lush forest and gorgeous beaches await you, along with the perfect photo opportunities for a once in a lifetime chance to capture raw island nature untouched by man for hundreds of years. Take a day trip or make it an overnight campout! Either way, the trip to Bois Blanc is always an adventure that you will never forget! 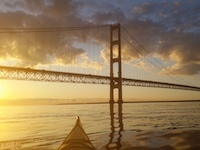 The brave and conditioned paddler will enjoy circumnavigating Mackinac Island. Enjoy unprecedented scenes of the Mackinac Bridge, Mackinac Island Lighthouse, and Round Island Lighthouse as you ride waves and take in the scenery from north, south, east, and west. Picture taking and wildlife are a couple of the great features of this highly recommended tour. 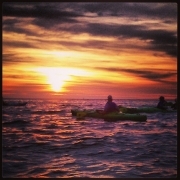 We start and end each day at Great Turtle Kayak with two of our favorite tours: the sunrise tour & the sunset tour near the Mighty Mackinac Bridge. Immerse yourself in the rays of the Sun in absolutely the most gorgeous times of day. Take a relaxing cruise around the coast and ride the waves as you bathe in the picture perfect waters and epic skies of the East and West. 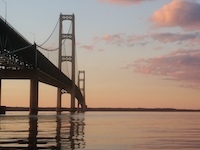 Enjoy a spectacular tour around the Mackinac Bridge. Glide through the clear waters as you view Fort Michilimackinac from the water. 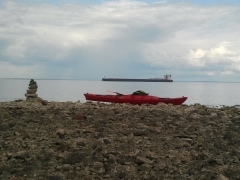 Venture around passing sailboats near the shores of the Michilimackinac State Park and take in the gorgeous views. Test your paddling skills by maneuvering under the bridge and around the towers. Our guides will help you to become comfortable enough to journey just beyond the shore to experience the wide open waters of the Straits and to catch a stunning peek at the lighthouse and passing freighters. Details - short length, appx 1-2 hrs, to the waters surrounding and underneath the Mackinac Bridge. Reserve a Mackinac Bridge Tour Online Now! Enter the bay West of the Mackinac Bridge, towards McGulpin Point and glide past the beautiful Michilimackinac State Park coastline to arrive the old fashion way... by water! Bridge vistas, Fort Michilimackinac and passing freighters in the distance are some of the favorite highlights of this highly recommended tour. 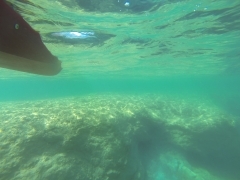 Details - medium length, appx 2 hrs, to the waters near McGulpin Rock and back. Reserve a McGulpin Point Excursion Tour Online Now!